Our studio boasts a 300+ square foot live room, two isolation rooms, and an isolation booth. We are fully equipped to accommodate most recording configurations, whether it be a solo classical pianist, a 4 piece rock band, a string quartet, or a large jazz ensemble. You can view our full equipment list as well as view photos of our recording rooms by following the links at the top of the page. We offer audio mixing services for projects in any genre and at any level of completion. Our studio is equipped with an AVID C|24 console. This enables our engineers to mix in-the-box and utilize a wide selection of plug-ins, while simultaneously allowing them to mix with a hands-on, analog feel. To view our audio software and plug-ins refer to our Equipment List. Trading 8s offers audio editing services and vocal tuning as part of mixing options or as a standalone service. Our head engineer is trained in music theory and is Pro Tools certified. This understanding enables our studio to offer clients a comprehensive and seamless editing experience. We offer 4kHD video recordings of in-studio sessions. 5 cameras Full HD to 4k 30p. You will leave with up to 5 hours of raw 4k footage of your session (1 hour per camera) or 10 hours of Full HD (2 hours per camera). Additional rates apply. Trading 8s offers live on-site multi-track recordings of your performances. Our mobile setup can record up to 18 tracks of audio from your rehearsal or gigs. Chris Sulit is a musician, songwriter, sound engineer, producer, and recording studio owner that has been involved in the NYC area music industry for over a decade. His recent acknowledgements include a Recording Academy Grammy Award for Engineer on Best Latin Pop Album, a Latin Academy of Recording Arts & Sciences Grammy Award for Engineer on Best Tango Album, and a Peabody Award for Engineer on Original Podcast. Chris specializes in studio recording and mixing, and is also a freelance FOH live sound engineer. In 2013, Chris opened Trading 8s Recording Studio, and personally designed the space with quality and comfort in mind. His mastery of the recording art is regularly supplemented with growing musicianship, continuing education, and research on the latest techniques and technology. 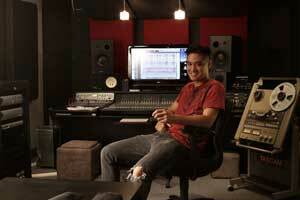 Though he works primarily as head engineer at Trading 8s, he also freelances at other recording studios. Chris is a graduate of Drexel University. He is a member of the Recording Academy and the Audio Engineering Society. "Engineer and mixer Chris Sulit nicely captures every nimble note from the flute, sax and grand piano, from lively flourishes to softer moments when notes linger in the air." "...the recording is absolutely flawless – you’ll feel like they’re right there in your living room playing a personal set for you!"